I am an Assistant Professor in the Mechatronics Engineering Program at Sabanci University. I earned my B.S and M.S. degrees in Mechanical Engineering at Middle East Technical University, Ankara, Turkey in 2006 and 2009, respectively, before joining at Carnegie Mellon University (CMU) in Pittsburgh, USA. At CMU, I worked in the Multi-scale Manufacturing and Dynamics Laboratory to understand the dynamic behaviour of the mechanical micromachining process. After I graduated in 2014, I continued working in the same laboratory as a postdoctoral research associate until August 2015. My research interests focus on developing novel high-fidelity dynamic modeling approaches to accurately and precisely capture the vibrational behavior of complex engineering structures, experimental modal analysis techniques, advancing multi-scale manufacturing processes and related equipment/sensors, and fabrication of micro-scale bio-devices. Looking for highly motivated undergraduate and graduate students to work in projects related with dynamis, vibrations, and micromanufacturing. If you are interested, please contact me via e-mail. You can find the necessary information about graduate applications here. Our paper, “Three-dimensional vibration behavior of FGM doubly-curved laminated structures”, has been presented at International Modal Analysis Conference. Our paper, “Predicting the rotating tool-tip dynamics in mechanical micromachining using modal testing”, has been presented at International Congress on Machining. New funding from Tubitak (3501 Career Development Program). Our project titled 'Development of a new spectral modeling approach for accurate and computationally efficient prediction of the three-dimensional strains/stresses, buckling, and dynamic behavior of composite structures and optimization of structural and dynamic behavior of composite structures' has been accepted. 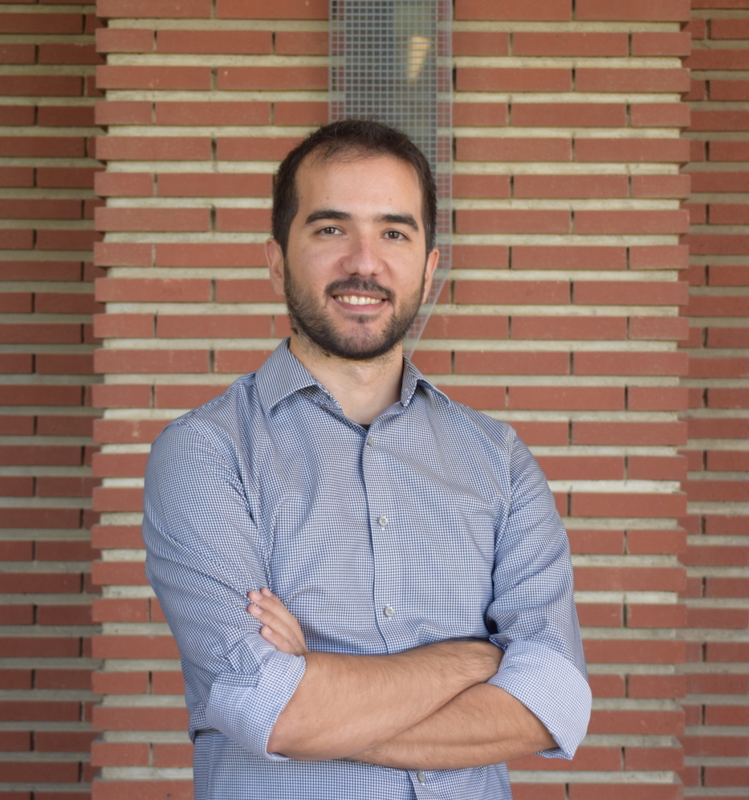 Structural Dynamics Research Group is located in the Faculty of Engineering and Natural Sciences at Sabanci University and led by Dr. Bekir Bediz. Our primary research interests include (1) developing high fidelity and computationally efficient models to accurately predict the dynamics of multi-dimensional complex structures of multi-physics nature, (2) applying these developed techniques in emerging high-impact engineering problems, (3) modal testing and analysis, (4) modeling and experimentation of manufacturing processes, specializing in mechanical manufacturing and its applications. Vibration behavior of composite structures is critical for a broad range of applications in diverse industries such as aerospace, automotive, and ship-building. This concept has attracted increasing attention due to its flexibility to achieve desired material properties (such as to obtain high specific strength and high specific rigidity) and its wide range of applications. A large body of literature has been devoted to the modeling dynamics (vibrational behavior) of composite structures. However, most of the studies focus on simple geometries and boundary conditions such as beam (one-dimensional) and rectangular or circular plate (two-dimensional) models. And the methods developed using higher order modeling approaches are generally computationally inefficient. In this study, our aim is to develop a novel modeling approach that will enable accurately and (computationally) efficiently capturing the dynamics of different kinds of composite stuctures having arbitrary geometries and boundary conditions. Due to their high stiffness-to-weight ratio, laminated composite structures are widely used in many fields of engineering such as aviation, automotive and ship industry. Most of the time, these laminated composite panels are exposed to dynamic forces that can cause resonances; thereby leading to excessive vibrations or even failures/malfunctions. Since these structures can be tailored in the design process, achieving an optimum design in these structures will prevent any adverse effect during its operation. Until recently, constant stiffness laminated composites were mostly used in these structures, where each layer of the composite structure (each laminate) was produced using a certain fiber angle. The desired design strength and dynamic properties of these flat fibers in each layer can be optimized to increase the required performance of the part. With the recent technological advancements in manufacturing of composite materials, laminates with variable stiffness properties can be produced using curvilinear fibers within each layer. Since these laminates provide better load distribution within the structure, they can perform better both statically and dynamically compared to constant stiffness composite structures. The main goal of this study is to design the curvilinear fiber paths of variable stiffness laminated composite structures to meet the design requirements using multi-objective optimization approaches and a high-fidelity modeling technique to accurately and (computationally) efficiently predict the dynamics of variable stiffness laminated composite structures. Piezoelectric structures have been widely used in a range of applications including vibration control, energy harvesting, structural health monitoring, and also surface haptics over the past few decades. Among the transducers that convert the mechanical (electrical) energy to electrical (mechanical) energy, piezoelectric transducers are mostly preferred to the electromagnetic and electrostatic ones due to their high power density and ease of manufacturing at different size scales. 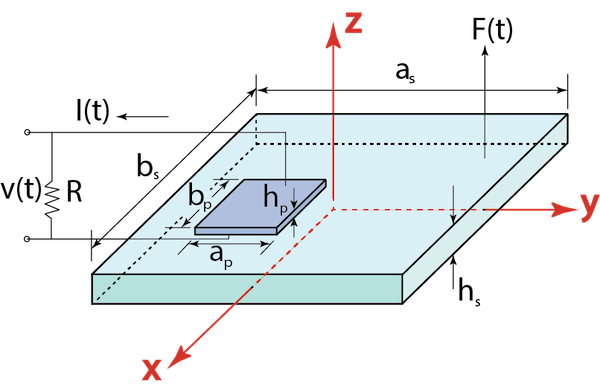 The most common use of piezoelectric materials in the form of patches/layers is by integrating them to the surfaces of flexible beam/plate-like structures, and thus utilizing the bending motion for generating electrical signal and vice versa (applying a voltage to generate a bending deformation). In this project, we are developing a novel multiphysics modeling approach based on spectral-Tchebychev technique to maximize the electricity generation via energy harvesting. It is highly challenging to predict the dynamics of (assembled) structures that are too large or complex to be analyzed as a whole. To address this issue, I will develop an ST simulation framework to analyze highly complex structures. To predict the dynamics of (assembled) structures, a substructuring algorithm will be applied to divide the complex structure into simpler geometries. Then, each of these simpler substructures will be solved using the ST method. Depending on the geometry of each substructure and also to increase the numerical efficiency, either a 1D-, 2D-, or 3D-ST approach (1D- and 3D-ST approaches are already developed during my graduate studies) will be implemented to obtain dynamic behavior. Lastly, to obtain the overall dynamics of the assembly structure, substructures will be combined via a component mode synthesis approach or a frequency based coupling technique. The first application of this study will be on predicting the workpiece dynamics. During the machining operation, the dynamic behavior of the workpiece changes continuously due to mass removal. The interaction between the workpiece and the cutting tool affects the process quality. Since the dynamics of the workpiece changes during cutting, its effect should be taken into account to accurately determine the process stability. Mechanical micromachining is an emerging technique for producing three-dimensional complex micro-scale geometries on a broad range of materials. In particular, it finds applications in biomedical and analytical devices, tribological surfaces, and medical devices. Effectively addressing the strict accuracy requirements of the micromachining application necessitates understanding and control of dynamic behavior of micromachining system, including motion actuators, spindle, and the tool, as well as their coupling with the mechanics of the material removal process. The dynamic behavior of the tool-holder-spindle-machine assembly, as reflected at cutting tip of a micro-tool, often determines the achievable process efficiency and quality. However, the existing (macro-scale) technique cannot be used to accurately model micromachining dynamics. 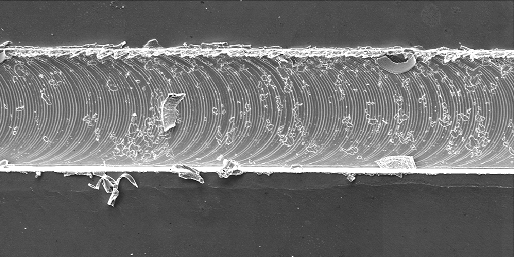 Furthermore, new experimental techniques are needed to determine the speed-dependent modal characteristics of the ultra-high-speed spindles that are used during micromachining. The overarching objective of this research project is to derive and validate models for the micromachining process dynamics to enable prediction of micromachining process accuracy and efficiency (throughput). 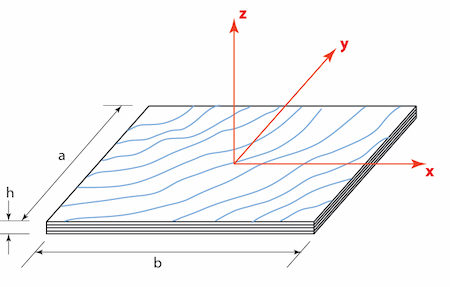 This paper presents a new approach, referred to here as the two-dimensional spectral-Tchebychev (2D-ST) technique to predict the dynamics of thick plates having arbitrary geometries under different boundary conditions. The integral boundary value problem governing the dynamics of plate-like structures is obtained using the Mindlin plate theory and following an energy-based approach. To solve the boundary value problem numerically, a spectral-Tchebychev based solution technique is developed. To simplify the calculation of integral and derivative operations and thus to increase the numerical efficiency of the solution approach, a one-to-one coordinate mapping technique is used to map the arbitrary geometry onto an equivalent rectangular in-plane shape of the plate. The proposed solution technique is applied to various different plate problems to assess the accuracy and show the applicability of the technique. In each case, the convergence of the solution is analyzed, and the predicted (non-dimensional) natural frequencies are compared to those found in the literature or to those found using finite element modeling. It is shown that the calculated natural frequencies converge exponentially with increasing number of Tchebychev polynomials used and are in excellent agreement with those found in the literature and found form a finite elements solution. Therefore, it is concluded that the presented spectral-Tchebychev solution technique can accurately and efficiently capture the dynamics of thick plates having arbitrary geometries. Furthermore, the utility of the 2D-ST is demonstrated by comparing the results obtained using a three-dimensional solution approach. This paper presents the application of the three-dimensional spectral-Tchebychev technique to accurately predict the vibration behavior of bi-directional functionally graded material curved parallelepipeds including geometries such as beams, thin/thick plates, and solids. In this study, the material distribution within the domain of the structure is obtained using bi-directional Mori-Tanaka method. 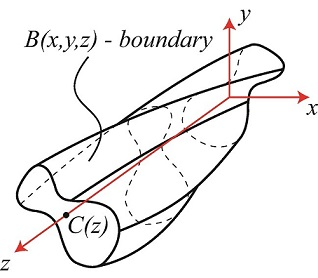 To derive the boundary value problem governing the dynamics of functionally graded curved parallelepipeds, three-dimensional elasticity equations are used together with extended Hamilton’s principle. Numerical solution of the integral boundary value problem is performed using the three-dimensional spectral Tchebychev approach. To validate and assess the performance of the presented solution approach, a number of case studies are conducted. In each case study, the non-dimensional natural frequencies and mode shapes are calculated and compared to those found using a finite element solution approach. Furthermore, computational time of the simulation is measured in each case. It is shown that the presented solution technique enables accurate prediction of vibration behavior of bi-directional functionally graded curved parallelepipeds as precise as a finite elements method, but for a fraction of the computational cost. This paper presents the application of the spectral-Tchebychev (ST) technique for solution of three-dimensional dynamics of curved beams/structures having variable and arbitrary cross-section under mixed boundary conditions. To accurately capture the vibrational behavior of curved structures, a three-dimensional (3D) solution approach is required since these structures generally exhibit coupled motions. 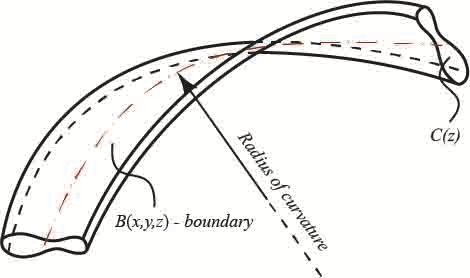 In this study, the integral boundary value problem (IBVP) governing the dynamics of the curved structures is found using extended Hamilton's principle where the strain energy is expressed using 3D linear elasticity equation. To solve the IBVP numerically, the 3D spectral Tchebychev (3D-ST) approach is used. To evaluate the integral and derivative operations defined by the IBVP and to render the complex geometry into an equivalent straight beam with rectangular cross-section, a series of coordinate transformations are applied. To validate and assess the performance of the presented solution approach, two case studies are performed: (i) curved beam with rectangular cross-section, (ii) curved and pretwisted beam with airfoil cross-section. In both cases, the results (natural frequencies and mode shapes) are also found using a finite element (FE) solution approach. It is shown that the difference in predicted natural frequencies are less than 1%, and the mode shapes are in excellent agreement based on the modal assurance criteria (MAC) analyses; however, the presented spectral-Tchebychev solution approach significantly reduces the computational burden. Therefore, it can be concluded that the presented solution approach can capture the 3D vibrational behavior of curved beams as accurately as an FE solution, but for a fraction of the computational cost. In this paper, we present a comprehensive approach for accurate measurement of high-bandwidth three-dimensional (3D) micromachining forces through dynamic compensation of dynamometers. Accurate measurement of micromachining forces is paramount to gaining fundamental understanding on process mechanics and dynamics of micromachining. Multi-axis dynamometers are used to measure 3D machining forces. However, specified bandwidth of these devices is below the frequencies arising during micromachining while using ultra-high-speed (UHS) spindles. This limitation arises from the effects of the dynamometer's structural dynamics on the measured forces. Therefore, accurate measurement of micromachining forces entails high frequency correction of the signals acquired by the dynamometer by removing the influence of those effects. The presented approach involves: (1) accurate identification of 3D force measurement characteristics of the dynamometer within a 25 kHz bandwidth to capture the effects of the dynamometer dynamics; (2) design of a pseudo-inverse filter-based compensation technique to remove the influence of the dynamic response in 3D; and (3) validation of the compensation technique through custom-devised experiments. Subsequently, the compensation method is applied to the micromilling process to obtain accurate broadband 3D micromachining forces using a miniature multi-axis dynamometer. It is concluded that the presented approach enables accurate determination of 3D micromachining forces. The presented compensation technique is also readily applicable for expanding the bandwidth of large dynamometers. This paper presents the spectral-Tchebychev (ST) technique for solution of three dimensional (3D) dynamics of rotating structures. In particular, structures that exhibit coupled dynamic response require a 3D modeling approach to capture their dynamic behavior. Rotational motions further complicate this behavior, inducing coriolis, centrifugal softening, and (nonlinear) stress-stiffening effects. Therefore, a 3D solution approach is needed to accurately capture the rotational dynamics. The presented 3D-ST technique provides a fast-converging and precise solution approach for rotational dynamics of structures with complex geometries and mixed boundary conditions. Specifically, unlike finite elements techniques, the presented technique uses a series expansion approach considering distributed-parameter system equations: The integral boundary value problem for rotating structures is discretized using the spectral-Tchebychev approach. 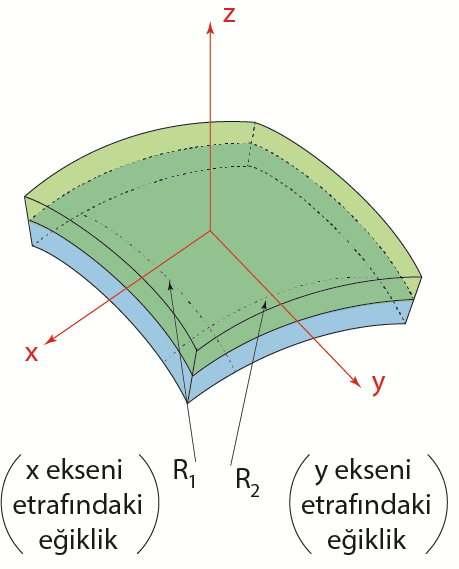 To simplify the domain of the structures, cross-sectional and rotational transformations are applied to problems with curved cross-section and pretwisted geometry. The nonlinear terms included in the integral boundary value problem are linearized around an equilibrium solution using the quasi-static method. As a result, mass, damping, and stiffness matrices, as well as a forcing vector, are obtained for a given rotating structure. Several case studies are then performed to demonstrate the application and effectiveness of the 3D-ST solution. For each problem, the natural frequencies and modes shapes from the 3D-ST solution are compared to those from the literature (when available) and to those from a commercial finite elements software. The case studies include rotating/spinning parallelepipeds under free and mixed boundary conditions, and a cantilevered pretwisted beam (i.e., rotating blade) with an airfoil geometry rotating on a hub. It is seen that the natural frequencies and mode shapes from the 3D-ST technique differ from those from the finite elements model by less than 1 percent for any rotational speed; however, 3D-ST approach significantly reduces the computational burden. It is concluded that the 3D-ST technique can be used to obtain the 3D dynamics of rotating structures, including those with mixed boundary conditions and complex geometry, in a precise and numerically efficient fashion. Micromachining dynamics commonly dictate the attainable accuracy and throughput that can be obtained from micromachining operations. The dynamic behavior of miniature ultra-high-speed (UHS) spindles used in micromachining critically affects micromachining dynamics. As such, there is a strong need for effective techniques to characterize the dynamic behavior of miniature UHS spindles. This paper presents a systematic experimental approach to obtain the speed-dependent two-dimensional dynamics of miniature UHS spindles through experimental modal analysis. 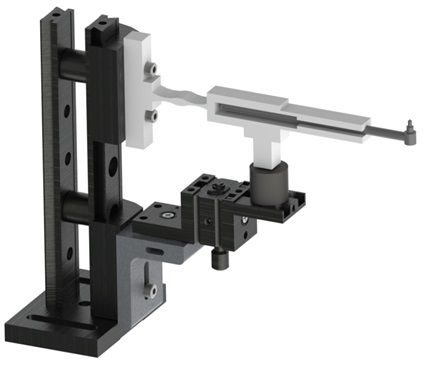 A miniature cylindrical artifact with 5 mm overhang is attached to (and rotating with) the spindle to enable providing the dynamic excitations to and measuring the resulting motions of the spindle. A custom-made impact excitation system is used to reproducibly excite the spindle dynamics up to 20 kHz while controlling the impact force. The resulting radial motions of the spindle are measured in two mutually perpendicular directions using two independent fiber-optic laser Doppler vibrometers (LDVs). To ensure the mutual orthogonality of the measurements, the two lasers are aligned precisely using an optical procedure. A frequency-domain filtering approach is used to remove the unwanted spindle motion data from the measurements, thereby isolating the dynamic response. The spindle dynamics is then represented in the form of frequency response functions (FRFs). A global curve-fitting technique is applied to identify natural frequencies and damping ratios. The developed approach is demonstrated on a miniature UHS spindle with aerodynamic bearings, and dynamic characteristics are analyzed at different spindle speeds and collet pressures. The spindle speed is shown to have a significant effect on dynamic response, especially at higher spindle speeds, while the collet pressure is observed not to have any significant effect on the spindle dynamics. It is concluded that the presented approach can be used to characterize the dynamics of miniature UHS spindles effectively. Miniature components and devices are increasingly seen in a myriad of applications. In general, the dynamic behavior of miniature devices is critical to their functionality and performance. However, modal testing of miniature structures poses many challenges. This paper presents a design and evaluation of an impact excitation system (IES) for repeatable, high-bandwidth, controlled-force modal testing of miniature structures. Furthermore, a dynamic model of the system is derived and experimentally validated to enable the identification of the system parameters that yield single-hit impacts with desired bandwidth and force magnitude. 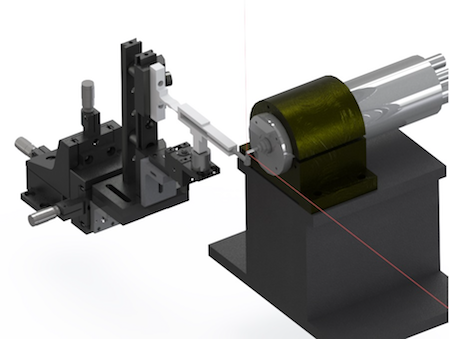 The system includes a small instrumented impact tip attached to a custom designed flexure-based body, an automated electromagnetic release mechanism, and various precision positioners. The excitation bandwidth and the impact force magnitude can be controlled by selecting the system parameters. The dynamic model of the system includes the structural dynamics of the flexure-based body, the electromagnetic force and the associated eddy-current damping, and the impact event. A validation study showed an excellent match between the model simulations and experiments in terms of impact force and bandwidth. The model is then used to create process maps that relate the system parameters to the number of hits (single vs. multiple), the impact force magnitudes and the excitation bandwidths. These process maps can be used to select system parameters or predict system response for a given set of parameters. A set of experiments is conducted to compare the performances of the IES and a (manual) miniature impact hammer. It is concluded that the IES significantly improves repeatability in terms of the impact bandwidth, location, and force magnitude, while providing a high excitation-bandwidth and excellent coherence values. The application of the IES is demonstrated through modal testing of a miniature contact-probe system. This paper presents the application of the spectral-Tchebychev (ST) technique for solution of three-dimensional dynamics of unconstrained pretwisted beams with general cross-section (including both straight and curved cross-sections). In general, the dynamic response of pretwisted beams presents three-dimensional (3D) motions, including coupled bending–bending–torsional–axial motions. As such, accurately solving pretwisted beam dynamics requires a 3D solution approach. In this work, the integral boundary value problem based on the 3D linear elasticity equations is solved numerically using the 3D-ST approach. 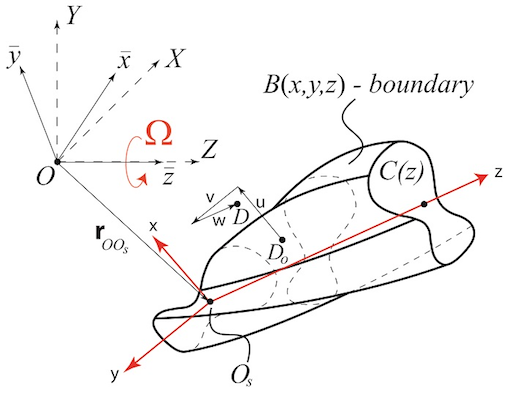 To simplify evaluation of the volume integrals, the boundaries are simplified by applying two coordinate transformations to render the pretwisted beam with curved cross-section into an equivalent straight beam with rectangular cross-section. Three sample pretwisted beam problems with rectangular, curved, and airfoil cross-sections at different twist rates are solved using the presented approach. 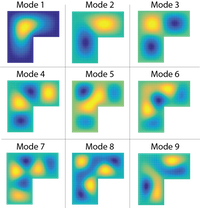 In each case, the convergence of the solution is analyzed, and non-dimensional natural frequencies and mode shapes are compared to those from a finite-element (FE) solution. Furthermore, cross-sectional stress and displacements are obtained from the 3D-ST solution. Lastly, the non-dimensional natural frequencies from the 3D-ST and a 1D/2D solutions are compared. It is concluded that the 3D-ST solution can capture the three-dimensional dynamic behavior of pretwisted beams as accurately as an FE solution, but for a fraction of the computational cost. Furthermore, it is shown that 1D/2D solution can lead to significant errors at high twist rates, and thus, the 3D-ST solution should be preferred. In this paper, we present a comprehensive technique for accurate determination of three-dimensional (3D) dynamic force measurement characteristics of multi-axis dynamometers within a broad range of frequencies. Many research and development efforts in machining science and technology rely upon being able to make precise measurements of machining forces. In micromachining and high-speed machining, cutting forces include components at frequencies significantly higher than the bandwidth of force dynamometers. Further, the machining forces are three-dimensional in nature. This paper presents a new experimental technique to determine the three-dimensional force-measurement characteristics of multi-axis dynamometers. A custom-designed artifact is used to facilitate applying impulsive forces to the dynamometer at different positions in three dimensions. Repeatable and high-quality impulse excitations are provided from a novel impact excitation system with a bandwidth above 25 kHz. The force measurement characteristics are presented within 25 kHz bandwidth using 3 × 3 force-to-force frequency response functions (F2F-FRFs), which capture both direct and dynamic cross-talk components to enable fully three-dimensional characterization. The presented approach is used to characterize the dynamic behavior of a three-axis miniature dynamometer. The effects of force-application position, artifact geometry, and dynamometer-fixturing conditions are explored. Moreover, the relationship between the force-measurement characteristics and structural dynamics of the dynamometer assembly is analyzed. It is concluded that the presented technique is effective in determining the force-measurement characteristics of multi-axis dynamometers. The changes in dynamometer assembly that affect its structural dynamics, including artifact (workpiece) geometry and especially the fixturing conditions, were seen to have a significant effect on force-measurement characteristics. Furthermore, the force-measurement characteristics were seen to change substantially with the force-application position. The presented technique provides a foundation for future compensation efforts to enable measuring forces within a broad range of frequencies. 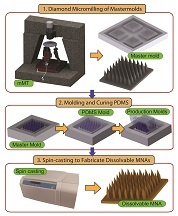 Design and evaluate a new micro-machining based approach for fabricating dissolvable microneedle arrays (MNAs) with diverse geometries and from different materials for dry delivery to skin microenvironments. The aims are to describe the new fabrication method, to evaluate geometric and material capability as well as reproducibility of the method, and to demonstrate the effectiveness of fabricated MNAs in delivering bioactive molecules. Precise master molds were created using micromilling. Micromolding was used to create elastomer production molds from master molds. The dissolvable MNAs were then fabricated using the spin-casting method. Fabricated MNAs with different geometries were evaluated for reproducibility. MNAs from different materials were fabricated to show material capability. MNAs with embedded bioactive components were tested for functionality on human and mice skin. MNAs with different geometries and from carboxymethyl cellulose, polyvinyl pyrrolidone and maltodextrin were created reproducibly using our method. MNAs successfully pierce the skin, precisely deliver their bioactive cargo to skin and induce specific immunity in mice. We demonstrated that the new fabrication approach enables creating dissolvable MNAs with diverse geometries and from different materials reproducibly. We also demonstrated the application of MNAs for precise and specific delivery of biomolecules to skin microenvironments in vitro and in vivo. This article investigates the feasibility of using supercritical carbon dioxide based metalworking fluids (scCO2 metalworking fluids (MWFs)) to improve micromachinability of metals. Specifically, sets of channels were fabricated using micromilling on 304 stainless steel and 101 copper under varying machining conditions with and without scCO2 MWF. Burr formation, average specific cutting energy, surface roughness, and tool wear were analyzed and compared. Compared to dry machining, use of scCO2 MWF reduced burr formation in both materials, reduced surface roughness by up to 69% in 304 stainless steel and up to 33% in 101 copper, tool wear by up to 20% in 101 copper, and specific cutting energy by up to 87% in 304 stainless steel and up to 40% in 101 copper. The results demonstrate an improvement in micromachinability of the materials under consideration and motivate future investigations of scCO2 MWF-assisted micromachining to reveal underlying mechanisms of functionality, as well as to directly compare the performance of scCO2 MWF with alternative MWFs appropriate for micromachining. Vibration behavior of structures with parallelepiped shape—including beams, plates, and solids—are critical for a broad range of practical applications. In this paper we describe a new approach, referred to here as the three-dimensional spectral-Tchebychev (3D-ST) technique, for solution of three-dimensional vibrations of parallelepipeds with different boundary conditions. An integral form of the boundary-value problem is derived using the extended Hamilton’s principle. The unknown displacements are then expressed using a triple expansion of scaled Tchebychev polynomials, and analytical integration and differentiation operators are replaced by matrix operators. 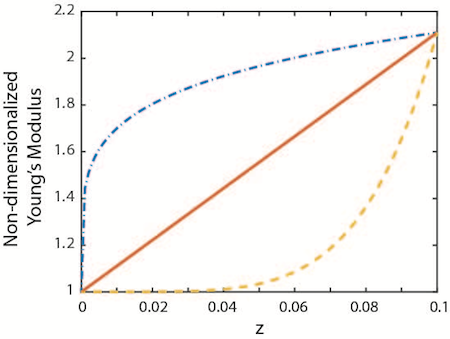 The boundary conditions are incorporated into the solution through basis recombination, allowing the use of the same set of Tchebychev functions as the basis functions for problems with different boundary conditions. As a result, the discretized equations of motion are obtained in terms of mass and stiffness matrices. To analyze the numerical convergence and precision of the 3D-ST solution, a number of case studies on beams, plates, and solids with different boundary conditions have been conducted. Overall, the calculated natural frequencies were shown to converge exponentially with the number of polynomials used in the Tchebychev expansion. Furthermore, the natural frequencies and mode shapes were in excellent agreement with those from a finite-element solution. It is concluded that the 3D-ST technique can be used for accurate and numerically efficient solution of three-dimensional parallelepiped vibrations under mixed boundary conditions. This paper presents a model for the three-dimensional (3D) dynamic response of endmills while considering the actual fluted cross-sectional geometry and pretwisted shape of the tools. The model is solved using the spectral-Tchebychev (ST) technique. The bending and the coupled torsional-axial behavior of four different fluted endmills is compared to finite element model (FEM) predictions and experimental results obtained using modal testing under free-free boundary conditions. For the first eight modes, including six bending and two torsional/axial modes, the difference between the 3D-ST and experimental natural frequencies is shown to be 3% or less for all four tools tested during this study. For the same modes, the 3D-ST and FEM predictions agree to better than 1%. To demonstrate its application, the 3D-ST model for the fluted section of a commercial endmill is coupled to the spindle–holder to predict the tool-point dynamics using receptance coupling substructure analysis (RCSA) with a flexible connection. The coupled model is validated through experiments. Vibration analysis is a promising technique in diagnosing metabolic bone diseases such as osteoporosis and monitoring fracture healing. The aim of this study is to observe the structural dynamic property changes of the tibia extracted from the vibration analysis data. In this study, bone mineral density and vibration measurements were made both in in vivo and in vitro conditions. The relationship between structural dynamic properties, obtained and bone mineral densities measured were investigated. Also, the effect of soft tissues on measured structural dynamic properties was analyzed. Natural frequency of the tibia decreased with decreasing bone mineral density that presented a weak correlation with the bone mineral density values measured by dual energy X-ray densitometer of the femur. In the case of in vitro experiments, it was observed that the effect of muscles on measurement results is higher than that of the effect of the skin and the fibula which makes the modal identification procedure difficult. However, having very large percentage changes in the loss factors when mineral content and collagen are reduced is an encouraging result to believe that damping measurements may yield a promising technique in diagnosing progressing osteoporosis and monitoring fracture healing period. The utilization of natural frequency alone as a diagnosing tool does not seem to be a sufficient method although there is a correlation between this parameter and bone mineral density. However, in vitro experiments showed that the identification of the loss factor is a promising technique in diagnosing progressing osteoporosis. In this paper, we present a comprehensive technique to obtain accurate three-dimensional (3D) micromachining forces for frequency bandwidths up to 25 kHz. The capability to precisely measure cutting forces is central to gaining fundamental understanding on micromachining mechanics and dynamics. Multi-axis dynamometers are used to measure 3D machining forces. Forces experienced during micromachining involve very high frequencies due to the ultra-high spindle speeds used during the process. However, the specified bandwidths of the dynamometers do not meet high frequency requirements of micromachining forces; this limitation stems from the structural-dynamics response of the dynamometers. Therefore, it is important to develop approaches to compensate for the distortions arising from the dynamic effects of the dynamometer's structure in order to accurately measure micromachining forces. This paper presents a fully 3D compensation approach to enable accurate determination of 3D micromachining forces within a wide frequency range. The presented approach involves: (1) accurate identification of 3D force measurement characteristics of the dynamometer in the form of 3x3 force-to-force frequency response functions (F2F-FRFs) matrix within a 25 kHz bandwidth, (2) design of an optimal inverse filter for post-processing the measured force data to remove the influence of structural dynamics of the dynamometer; and (3) validation of the compensation approach through impact testing where the actual applied force data acquired by the reference force sensor is compared with the corrected dynamometer measurements. Subsequently, the presented approach is demonstrated by obtaining 3D micromachining forces during micromilling of a brass workpiece. It is concluded that the presented approach is effective in high-frequency correction of dynamometer measurements for accurate measurement of 3D micromachining forces within the 0- 25 kHz frequency range. This course is designed both for undergraduate and graduate students. It is aimed to teach the fundamental concepts how systems vibrate. Fundamental aspects of vibrations for mathematical modeling, derivation/solution of equations of motion, and subsequent system analysis will be covered for discrete systems. This course deals with design and selection of mechanical elements such as welded joints, bolts, bearings, spur gears, shafts, brakes; alternative fatigue design methods with consideration of creep, yielding, fracture; basics of finite element analysis with emphasis on beam and plate models. I would be happy to talk to you if you need my assistance in your research or if you want to collaborate in a new research topic.